So (I admit) there WAS a time in my life when, for me, ‘heavy topping’ was full fat cream. 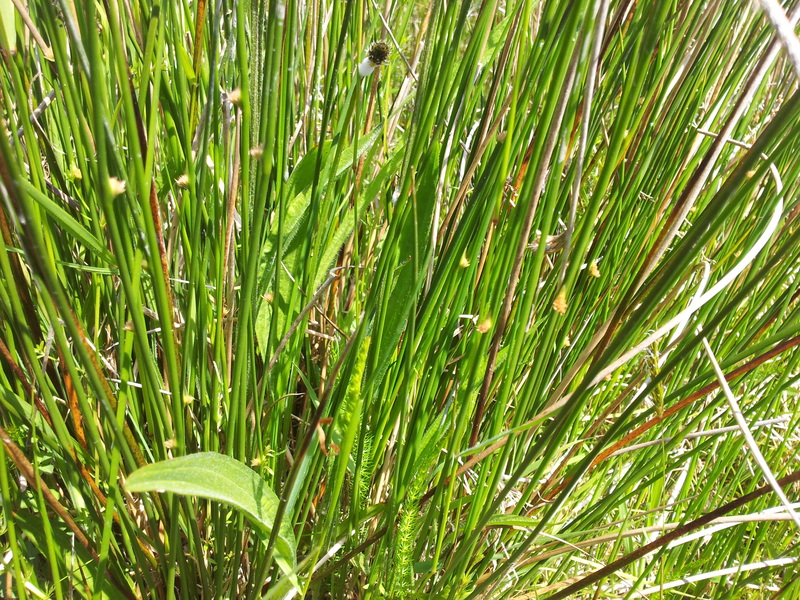 But then I met up with juncus effusus … the Latin means ‘soft rush’. Contrary to what might be expected, this soft rush (whilst thoroughly reprehensible) has NOTHING to do with the psychotropic effects of Class C narcotics. No, we’re talking grass management here (… oh dear, you’ll think I’m doing it again … but I’m not). Juncus effusus is a persistent and pervasive weed in acid, wet, nutrient depleted pasture land which has potentially massive costs associated with its impact on animal health … and if you’re going to have any real impact on controlling it without running to the massive expense of significant civil engineering, you’ve just GOT to do the right thing at the right time. 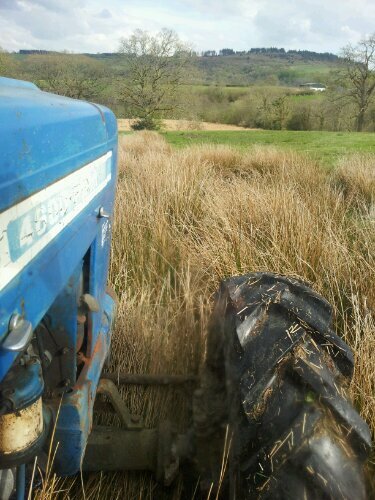 Invariably on our land, that involves a very heavy day in the field for Betty, the blue Ford 4-6. There’s no easy, long term alternative. 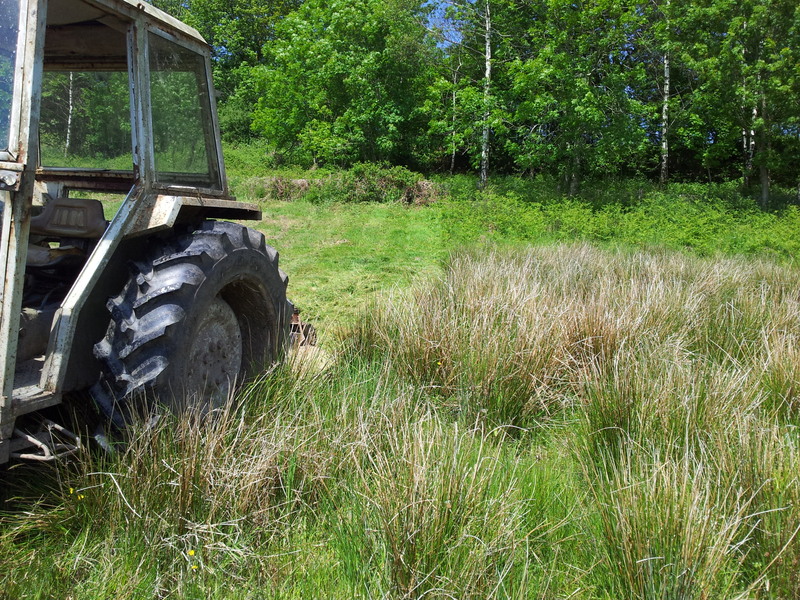 You just need to get onto the land with machinery and ‘top’ the rushes as low down as possible. This does two useful things. It lets the land dry out as it then gets exposed to sun and wind (whereas before it was kept damp by the overshadowing rushy canopy), and it allows grass previously choked out to get out into the sun, build up its strength and fight back. But timing it right is just crucial. There’s no point doing this in July or August. You really want to do it in late May or June before the rushes set seed and extend their nasty influence. Effectively you’ve got to seize the early opportunity – as soon as the land is dry enough to carry the weight of the tractor – and chop the seed heads off before they multiply the mischief. Here’s a photo of some of our juncus that is JUST setting seed (look for the light mustard fluffy bits along the edge of the stalks), and which needs topping as smartly as possible … before things get worse. Jesus (who seems to have been pretty smart about agriculture) tells a famous story of four sorts of soil, and one good sort of seed, with a sower who goes out to sow it. Of course, one sort of soil is rock hard and the seed bounces off it … only to be gobbled up by the birds. Another sort seems good but the underlying rock is very close to the surface, the seed shoots away but can’t put down sustainable roots and the sun very quickly burns the plants off. Of course, there is good soil that takes in the seed, which then puts down good roots and sustains a good harvest … but there’s also the soil that has weeds in it. Like our wet, acid fields, our environment encourages their growth. This isn’t a briar patch that Jesus describes, but apparently cultivated soil that still contains weed seeds despite making very good appearances. Naturally in His parable, the effect of these weed seeds is that they grow up and choke off the crop, subverting the fruitfulness of the process. Those seeds should have been put (of course) into properly prepared soil … but even then weed seeds spring up and need topping off. In the parable, NONE of this happens. Now, of course, Jesus didn’t just tell stories to pass time. He was talking about the weedy pasture of every person’s life where weeds easily spring up and choke off our relationship to God (as he explains a bit further down the page). Acting swiftly is absolutely crucial … before more seed gets set and the trouble just SPREADS. We need to be decisive toppers and weeders … not just of our fields but our souls. Weeds really don’t need very much encouragement to grow up and cut off our view of the Son.